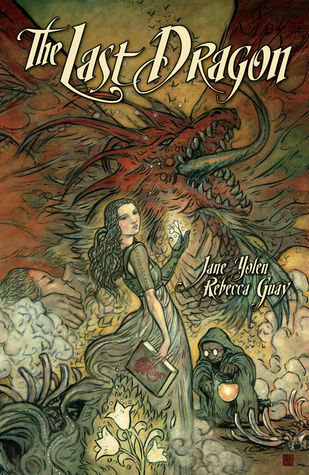 Master storyteller Jane Yolen (Owl Moon, Sword of the Rightful King) and celebrated fantasy artist Rebecca Guay (Swamp Thing, Magic: The Gathering) weave a textured and lyrical tale of adventure, homelands, and heroism the hard way.Two hundred years ago, humans drove the dragons from the islands of May. Now, the last of the dragons rises to wreak havoc anew — with only a healer’s daughter and a kite-flying would-be hero standing in its way. I am a big fan of Jane Yolen and of graphic novels. I thought this was going to be the perfect combination for me. Jane Yolen is someone that I would consider a master storyteller- her focus on detail and complex storylines have made me a huge fan. This was a solid story that I enjoyed. I would say that being an author that writes intricate stories is not easily translatable to graphic comics. The author does a good job of creating full characters and a complete storyline. I think this story would have blossomed more, given another hundred pages. I left the end of the story wishing more would have happened and that the story wouldn't have moved so briskly. I wasn't given enough time to really care about the characters and invest in their well-being. This isn't a mark against the author though, more of a compliment that I would have loved to read more of her storytelling. The artwork was beautiful. It was not done in a style of contemporary cartooning or manga. The artwork reminded me of fairytales and epic fantasy stories. The ladies were beautiful and easy to tell apart (which is a struggle in some graphic novels). The facial expressions and the way the illustrator drew the characters really brought out the personality of each person in the novel. It was obvious that the author and illustrator seemed to have the same vision for the story- the words and pictures were never at odds with each other, but flowed perfectly together. If you are a fan of non-traditional comics, or of the author, you would enjoy this book! Sorry: posting it again as I hope this time it makes better sense lol!!! You mention something that can often be overlooked though it can be a plus if heeded more often: being able to tell the ladies and men apart. I happen to LOVE anime but there are occassions where telling a dude from a girl gets...ahem...complicated.